Our sense of smell is something we don’t really pay any attention to—unless something goes wrong. The truth of the matter is that it is closely tied to the other senses, especially our sense of taste. What happens when your sense of smell goes on the fritz and you end up with something like parosmia? We’ll take a close look at this disorder: what it does to your sense of smell, parosmia causes, parosmia symptoms, and parosmia treatment. We will arm you with the knowledge you need to identify and treat parosmia. Let’s start with the first basic question: what is parosmia? What does it actually do to your sense of smell? Parosmia is a disorder that affects your sense of smell by misinterpreting it. Your brain takes in the information of the smell, but it doesn’t recognize it. Instead, the olfactory lobe of the brain reads the smell as something else, often offensive. 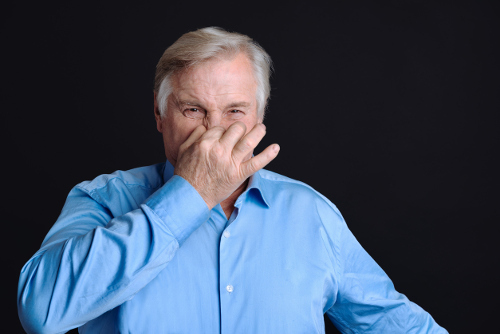 The disorder varies from person to person in that some patients will only be affected by one smell, while others may be affected by many smells. The most unlucky might be affected by every smell. The symptoms of parosmia are fairly easy to understand. The disorder causes certai to smell different, usually terribly. As we previously mentioned, it can be one specific smell or the smell of everything that triggers the disorder. For example, a piece of toast may smell like rotting meat to the person suffering from parosmia. In addition to the transformation of smells, due to the very close connection between your senses of smell and taste, the latter can also be altered. So when eating food, the food might also taste terrible. Sufferers of parosmia may find the smells so strong that it can make them feel physically ill.
URTIs like sinusitis, common cold, laryngitis, bronchitis, pharyngitis, sore throat, pertussis, and tonsillitis. These all have the ability to change your perception of smell. Smoking can damage your perception of smell fairly quickly, but long-term smoking can cause the onset of parosmia. A number of neurological disorders like Alzheimer’s disease and Parkinson’s can cause the brain to process things in different ways than they should, including smells. Fleshy polyps can form in your nasal cavities. Because of their location, their growth can affect your sense of smell, leading to parosmia. The inhalation of chemicals can damage not only the sense of smell, but can also damage the brain. That being said, it’s not surprising that this can lead to parosmia. Unfortunately, as we get older, our brains change for both good and bad. Those changes can affect the olfactory lobe of the brain to the point where parosmia can take place. There are a number of medications that may have the side effect of altering your sense of smell and triggering parosmia. Some antibiotics, for example, may cause this. These are the most common causes of parosmia, and as you can probably tell, they could happen to anyone. This means options for treatment are very desirable. With all of these gnarly symptoms, you likely want to treat your case of parosmia as soon as possible. Unfortunately, this is where parosmia gets tricky. For the most part, there is no cure for parosmia. There is no pill that you can take or inhaler that you can breathe in to make parosmia to go away. However, there is a little bit of hope. Parosmia can fade and even disappear when the initial cause of parosmia is eliminated. For example, if it’s an antibiotic causing your parosmia, once that round of antibiotics is done, you may find that your sense of smell returns to normal. If you are a smoker, your parosmia may disappear with time. But, parosmia is connected to the brain, so there is the possibility that it may ultimately stay. For example, toast may still smell like rotting meat, but it may not happen every time you smell toast. On the other hand, you may unfortunately be stuck with parosmia for the rest of your life or until a cure is found. You never really think about your sense of smell. You simply go about your day smelling flowers or dog poop—it’s just an everyday part of life. It’s only when that part of life is disrupted that you realize how important the sense is to you. Don’t take your sense of smell for granted as you never know when something like parosmia may occur and turn it into something terrible. “What Is Parosmia? Its Causes, Symptoms And Treatment,” Tandurust, September 21, 2015, http://www.tandurust.com/health-qna/parosmia-causes-symptoms.html, last accessed May 31, 2017. “Parosmia And Phantosmia,” Fifth Sense, http://www.fifthsense.org.uk/parosmia-and-phantosmia/, last accessed May 31, 2017. “What is Parasomia: Causes, Symptoms, Treatment, Diagnosis, Surgery,” ePain Assist, https://www.epainassist.com/face-mouth-throat/what-is-parasomia, last accessed May 31, 2017. Nicks J., “Causes and Symptoms of Parosmia,” Buzzle, April 25, 2015, http://www.buzzle.com/articles/causes-and-symptoms-of-parosmia.html, last accessed May 31, 2017. On, S., “What Are The Causes Of Parosmia? Symptoms & Treatment Options,”Simple Remedies, September 21, 2016, http://www.simple-remedies.com/health-questions/parosmia-causes-traetment.html, last accessed May 31, 2017.